On warm Friday afternoons, among the hammocks, grill-outs and Frisbee games, the Notre Dame Juggling Club gathers on North Quad with bags of tennis balls, clubs and plastic rings. They put on impromptu juggling performances for passersby and teach anyone who is interested how to juggle. 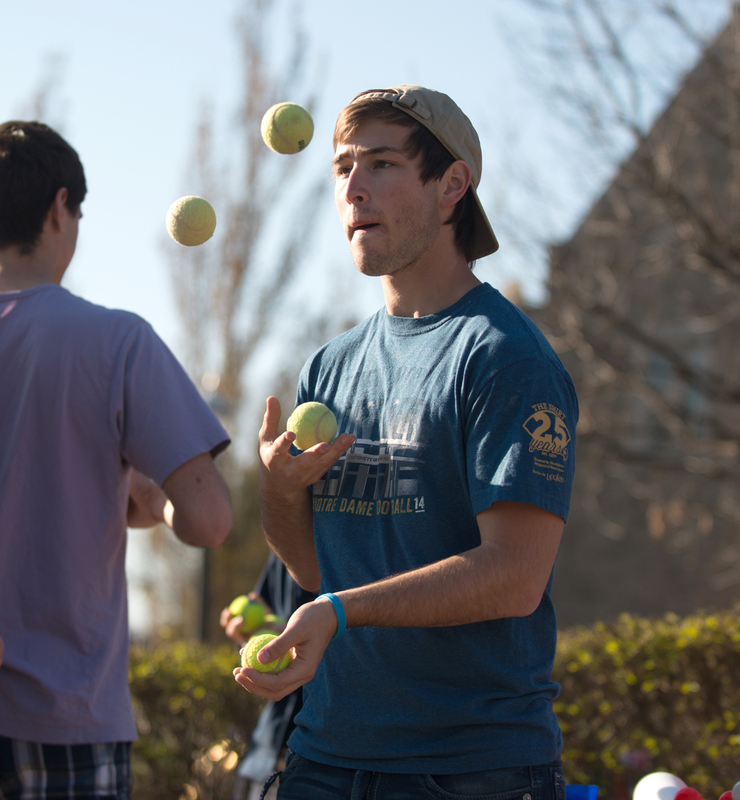 Sean Gleasom of the Notre Dame juggling club demonstrates his juggling skills with tennis balls. The club welcomes students who “wish to advance their juggling skills and those skills associated with juggling, i.e. unicycling,” according to the Student Activities Office website. Club president and junior Steven Brill said 15 to 20 people come to meetings regularly, depending on the time of year. When the weather is cold, the group meets Friday afternoons at the racquetball courts in Rockne Memorial Gym; when it’s warm, they “generally just hang and juggle” by Stonehenge, Brill said. The club also performs at various events throughout the year — they’ve performed at Holy Cross intramural basketball all-star game and a parade at the Irish Fest of Manhattan, Illinois. On Sunday, they juggled at the unveiling of The Shirt. People join the juggling club with a range of levels of experience — some have only a basic knowledge of the craft and learn through the club, starting with a single ball and going from there. “There are people who will say, ‘Oh, I’ve tried this like once, so I have a little bit of knowledge on how to do it but I haven’t learned how,’” sophomore Mark Kinney said. Others knew how to juggle before coming to Notre Dame and use the club as a way to practice. Sophomore Cate Devey said she learned how to juggle in order to one-up her brothers. “I hate not being able to be better than them at things, so I taught myself how to juggle,” she said. Sophomore Andrea Ringer said she unsuccessfully tried to teach herself with a book but was able to learn eventually. Brill said he and his brother started juggling when he was in fifth grade, and he kept up the hobby through high school, where he was his school’s juggling club president. Before he went to college, he worked for the Cincinnati Circus Company, which performs at events in the city. Some members can juggle four or five objects at a time. They use different techniques — there’s the normal Cascade, and there are more complicated patterns like Mill’s Mess, Chops or the 5-3-1. Some can juggle clubs or rings as well as balls. Others, like Brill, have graduated to juggling knives and torches, something the club hopes to use next year. Brill said juggling performances can vary in style — there’s what he calls “strolling juggling,” or walking among the audience while juggling. There are more comedic routines and artsier, more musical performances. Most of the equipment the club uses belongs to Brill, he said, and next year, the group hopes to raise money to buy its own equipment so it can still have a range of gear after Brill graduates. Brill said juggling and the process of learning new techniques is a stress reliever. Emily McConville is a news writer and photographer for the Observer. She is a senior studying history and Italian with a minor in journalism. She is from Louisville, KY and lives off-campus.